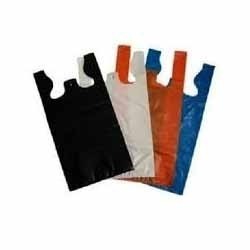 The Colorful Plastic Carry Bag provided by us is used for the purpose of packing and carrying items and is available to clients at affordable market prices. Established in the year 1992 at Mumbai, we, Madina Stores, are a reputed Trader, Supplier and Wholesaler of premium quality Aluminium Foil, Plastic Carry Bag, Cake Box and Board, Decorative Candles, Disposable Chopsticks, Cleaning Products, Wrapping Film, Foil Container, Garbage Bags, Ice Cream Stick, Kitchen Rolls, Disposable Glass and Plate, Plastic Container, Popcorn Paper Box, Spoon and Fork, Disposable Straws, Tissue Box, Tissue Paper, Wooden Toothpick, Toilet Tissue Roll, Paper Products, Designer Balloons and Gift Foil Paper. These are manufactured at our vendor’s end using premium quality raw materials and are highly acclaimed for their outstanding quality. Latest manufacturing technology is used for the manufacture of these products in the most efficient manner. The products offered by us are highly acclaimed for their easy usage, convenient disposal and aesthetically appealing looks. We offer these to clients at budget friendly prices in the specifications required by them. The quality of our products is stringently checked by an adroit team of professionals in order to ensure impeccable quality as well as the complete satisfaction of the clients. Our dedicated team of professionals strive to cater to the clients in the best possible manner in order to ensure the complete satisfaction of the clients.